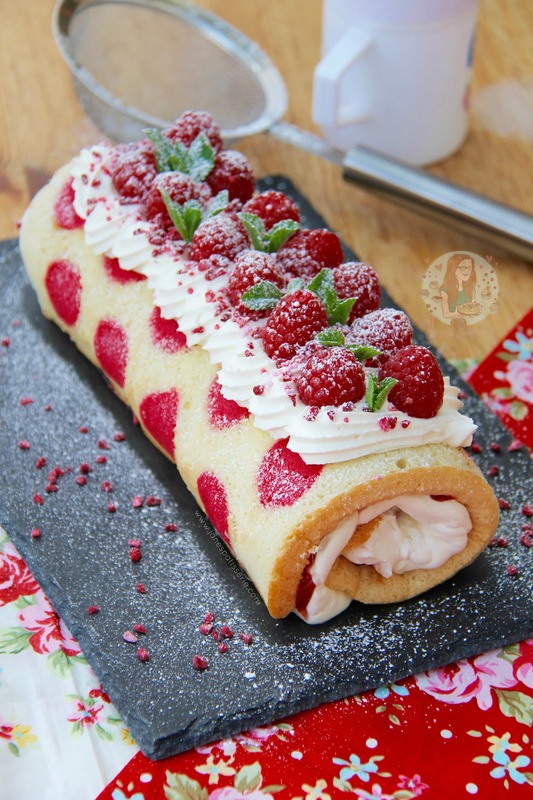 A Vanilla & Raspberry flavoured polka dot Swiss Roll, filled with fresh cream & fresh raspberries. 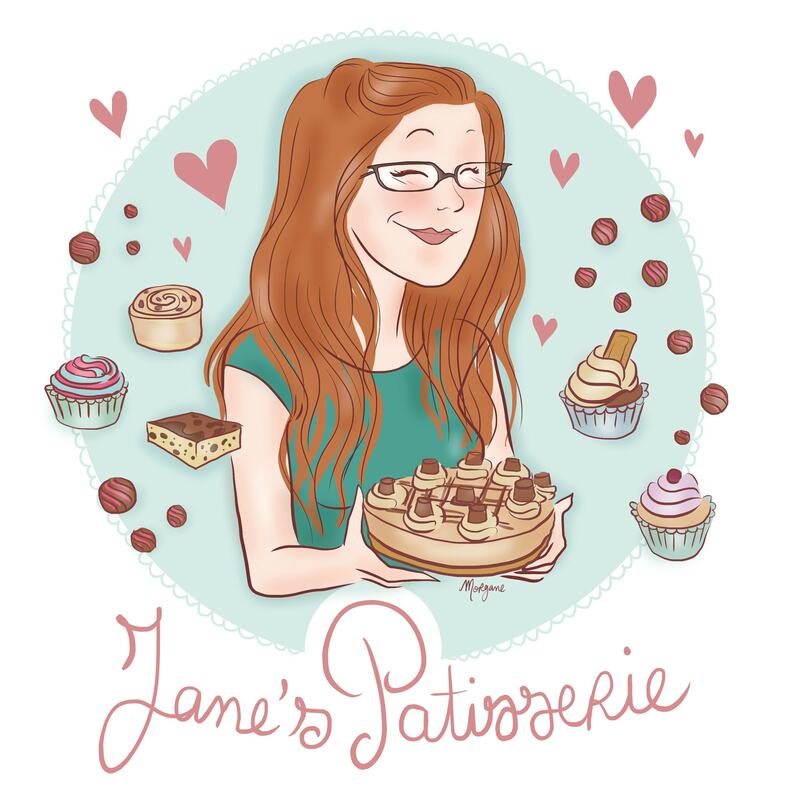 So, I wanted to have a bit of an adventure and review something that has been all over my social media profiles – the Bake Box! 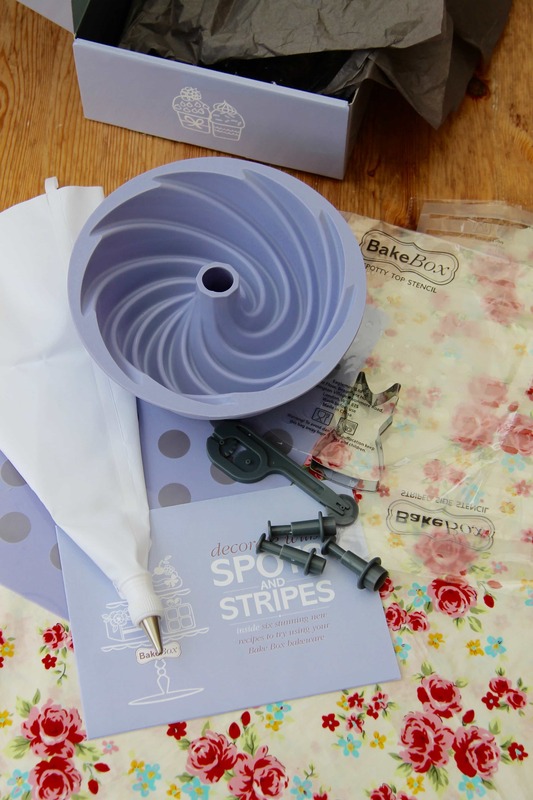 Its a lovely little invention from the Bake Club where every 2 months you will receive a new box for only £14.99 a month. This may sound like a lot of money.. HOWEVER, for what you get, its really not! You receive ‘bespoke decorating bakeware’ that are high quality and easy to use, as well as 6 recipes on lovely little cards that come in an envelope, and links to videos and how-to information on their website. I may sound like I am sponsored by them, and I must say that I am not. Yes, they sent me a box to review, but I could have slated them and ridiculed them for having a ridiculous idea, but I really don’t think that. The box is amazing, its presented beautifully in a gorgeous little box, everything is wrapped or covered in tissue paper… and the guys on twitter are lovely if you have a problem! Out of the 6 recipes, I wanted to try this one. It looked cute, and would be perfect for a treat for my mother who has been working hard recently and I am so glad I tried it! I was a little dubious that it might be rubbery, or annoying – but it surprised me! 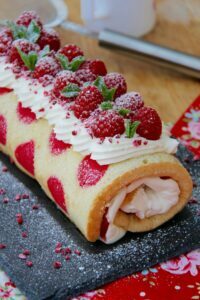 I have made patterned swiss rolls before as all you need to do is make sure the coloured bit is cooled and harder before you add the basic sponge on top, and you’ll have a beautiful pattern! 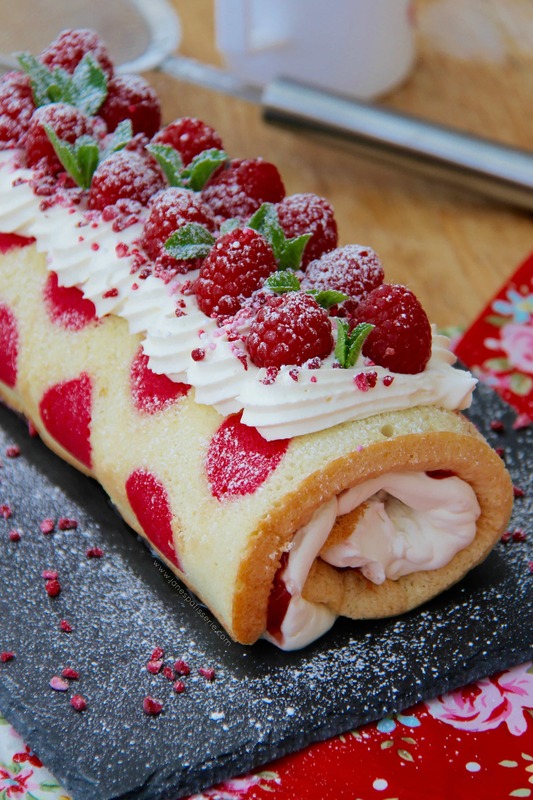 The flavouring of the fresh cream, raspberries and vanilla are delicious. I do have a few notes on the recipe, which you can see below! Now, as it has taken me some time to post this recipe & review as I have been SO busy, I am not sure if you can buy the contents of this particular box any more, however, the new one is coming out now and will be filled with equally as awesome stuff (you can still achieve the polka dot look without the mat, as I have mentioned below!) 🙂 The cute thing is that I don’t really know of anywhere else that does something like this, and it really is cute – I love the fact that you don’t know whats coming in the next box, but you know you’ll get a lot. 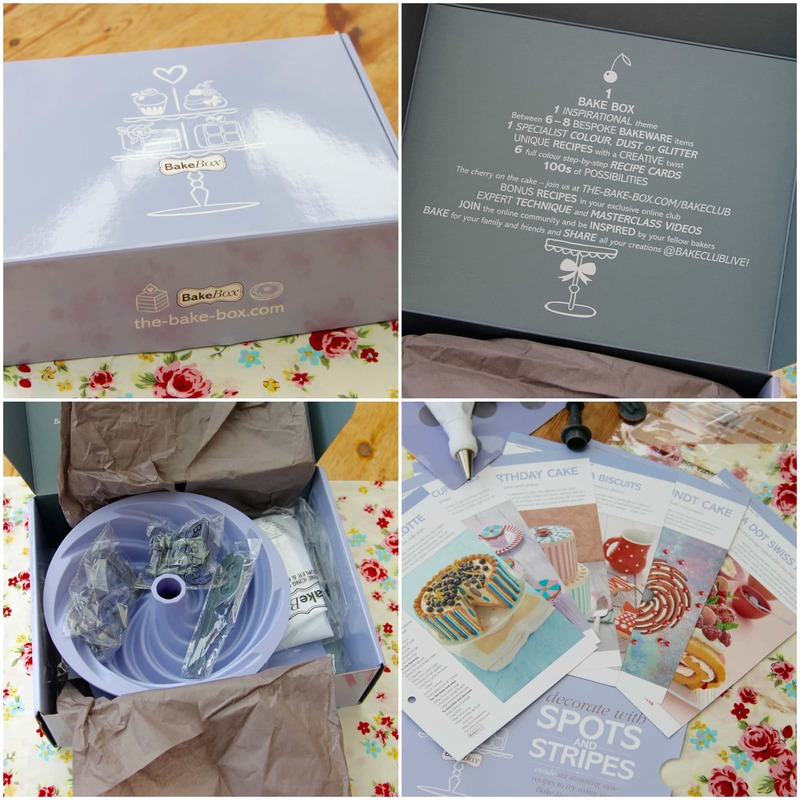 A cake tin, decorating tools, colourings/glitters, recipes and more – amazing! 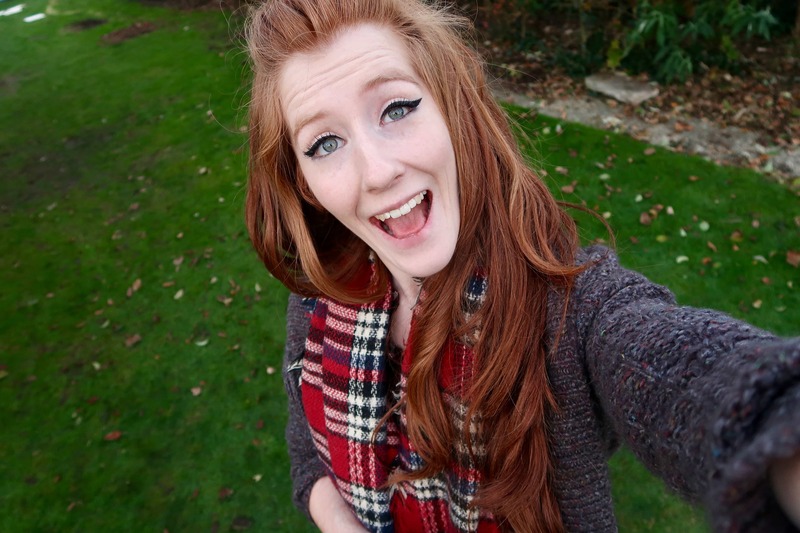 You can subscribe and buy it HERE! 1) Line a 10x15Inch Swiss Roll Tray with the Bake Box circle patterned Silicone Sheet (Or just greaseproof paper if you don’t have it) and brush lightly with oil to grease and leave to the side. 2) To make the Polka Dot pattern – Beat the butter and sugar together until light and fluffy, gradually beat in the egg whites until they are fully incorporated. Add in the vanilla & food colouring and stir gently till the batter is evenly coloured – fold through the flour. 3) Spoon the mixture into a piping bag – cut off the end and pipe carefully onto where the dots are (or into any pattern you want really!) and chill the tray in the fridge for now. 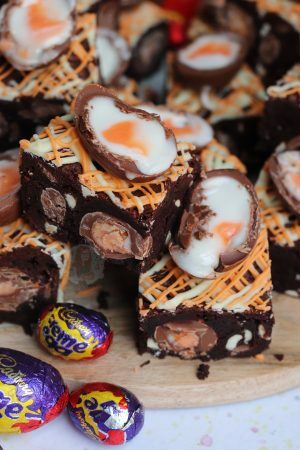 4) To make the sponge – Preheat the oven to 200C/180C Fan – whisk the eggs and sugar in a large bowl for 3-4m minutes until they are thick, pale and have doubled in volume. Carefully fold through the flour as little as possible. Remove the tray from the fridge and pour the mixture carefully over the pattern and gently spread. 5) Tap the tray onto the work surface to knock out the air bubbles and bake in the over for 10-12 minutes, or until the stone is going lightly golden. 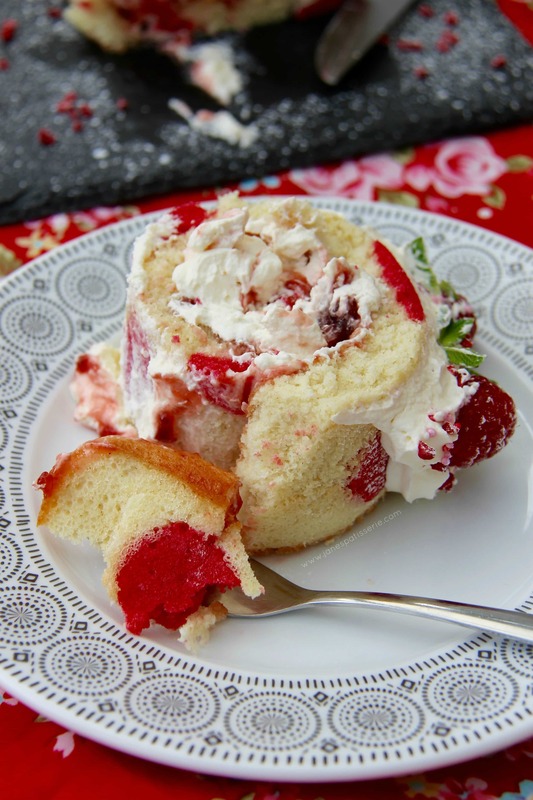 Allow the cake to cool in the tin for a few minutes and then roll the cake up carefully & tightly (silicone mat/paper included) and unroll again gently and leave to cool completely. 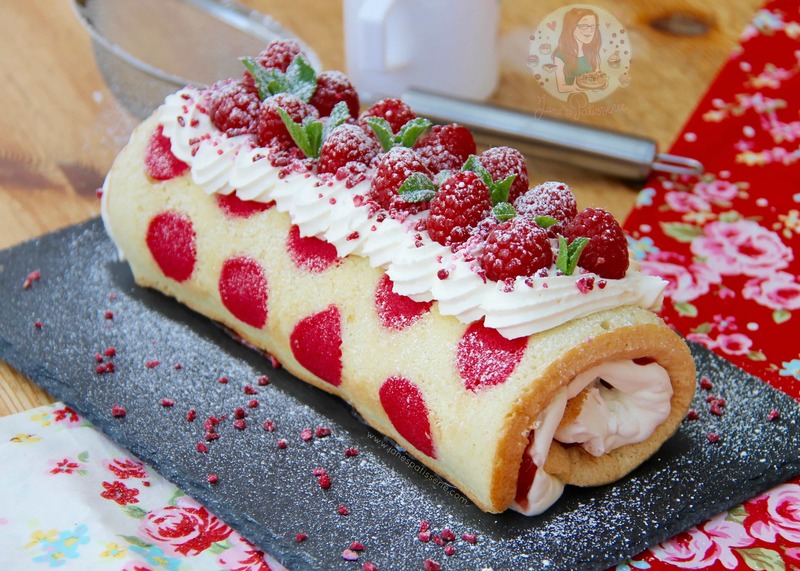 6) For the Filling – Whip the cream with the sugar until very thick and holding its shape – spread the jam and 2/3 of the cream onto the inside (not patterned side) of the cake – carefully roll up the cake whilst removing the silicone mat from other side as you do. Move the cake to your serving plate! I used a little too much food colouring (the one provided in the Bake Box) and it’s not a bad thing, but you really don’t need much at all. Also, if you can I would halved the ‘Polka Dot’ part of the recipe as it made far too much, so I ended up making two swiss rolls. The normal sponge has the perfect amount, but the ‘polka dot’ mix is a little much. 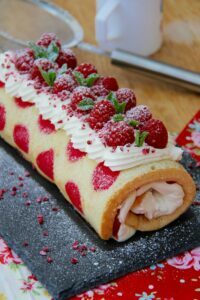 I also think filling wise, you only really need to use 300ml cream, as the 500ml managed to fill both of my swiss rolls. 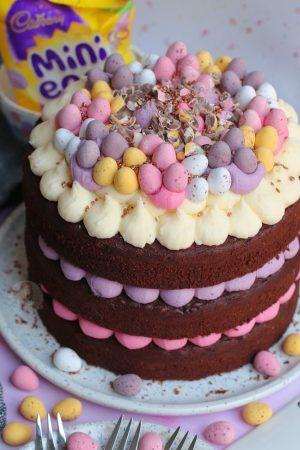 In this recipe I used the Bake Box Polka Dot Silicone Sheet, Rainbow Dust ProGel Pink food colouring, recipe and method from Bake Box. 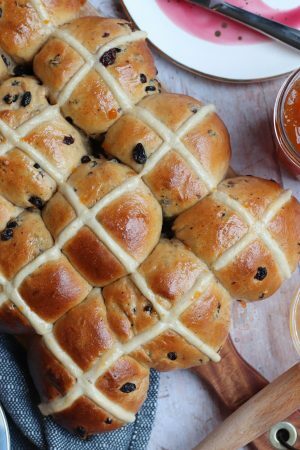 I did this so I could review the recipe – you can use any strong food colouring you like, and you can use any pattern you like if you line the tray with parchment paper – follow the recipe in the same way! This cake will last for 2 days in an airtight container in the fridge! You can subscribe to and buy the Bake Box HERE! Older Next post: Coffee Cake! Newer Previous post: Chewy Chocolate Chip Cookies!